Chief Howard Miller is the Chief of the Creole Wild West Mardi Gras Indian tribe and the President of the New Orleans Mardi Gras Indian Council. 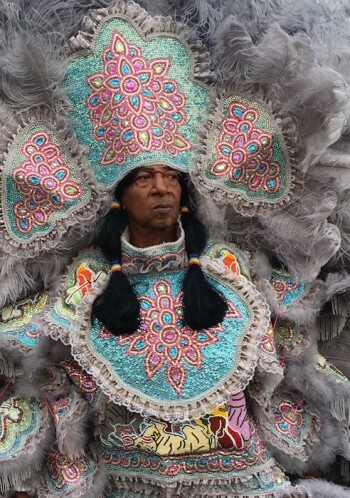 Chief Howard has been a Mardi Gras Indian since 1969, when he began the masking tradition as a Spy Boy for the Apache Hunters. After becoming Big Chief for the Apache Hunters, in the late 1970's, Chief Howard oversaw a merger of the Apache Hunters with the Creole Wild West, which is the oldest and largest Mardi Gras Indian tribe. He continues to serve as Chief of the Creole Wild West to date. Along with his duties as Chief of the Creole Wild West, Chief Howard administers his Mardi Gras Indian youth educational program. Each Saturday, Chief Howard and other members of the Mardi Gras Indian community teach children the traditions, heritage and practice of the Mardi Gras Indians, including how to sew beadwork and create the suits that the Mardi Gras Indians are known to wear on Mardi Gras and during festival season. Chief Howard's own suits have been on display in various exhibitions and museums. Chief Howard performed around the world as a Mardi Gras Indian, and he has lectured on Mardi Gras Indian tradition at numerous universities, schools, museums, the National Endowment for Humanities, the National Endowment for the Arts, the Future of Music Coalition Policy Summit, the Louisiana Endowment for the Humanities, and many other conferences and institutions. Chief Howard has been interviewed and featured in the New York Times, National Public Radio, Washington Post, the Associated Press, and numerous other publications and journals. Chief Howard makes regular appearances on New Orleans local radio station, WWOZ 90.7 FM. Chief Howard has been recognized with the State of Louisiana Governor's Arts Award for lifetime achievement in Folklife Heritage. Chief Howard was also given the HeartBeat Award by Offbeat Magazine for his contributions in continuing the Mardi Gras Indian legacy with his youth sewing program. Chief Howard has performed for many years at the New Orleans Jazz and Heritage Festival, and in 2009, he recorded the single "Here Come the Saints" with the late Dr. Wardell Quezergue and with the help of lifelong friend Dr. John.